I have used this quote many times myself, but I had never researched the quotation’s context until recently. This quote comes from an address given to the Public Education Association at a Meeting of the Berkeley Lyceum, New York, November 23, 1900. The speech was given the title, “I am a Boxer”, and its brief 588 word composition means that Twain spoke onstage for all of six minutes, applause aside. The historical background for the speech deals with European colonization in Africa and Asia, and the American efforts to annex the Philippines. Predictably, there was resistance by the natives of a country resulting in serious and costly conflicts such as the Boer War in South Africa and the Boxer Rebellion in China. Twain had joined with a number of other Americans including William Jennings Bryan, Andrew Carnegie, John Dewey, and William James in an effort to stop a new rush to colonize. They formed the Anti-Imperialist League, and for a short time they coordinated efforts to stop the developing American Empire. Twain’s speech also referenced Russia’s involvement in the Boxer Rebellion in joint operations with US Marines and British troops. His argument against Anti-Imperialism was satirically addressed in the next two paragraphs suggesting if the Public Education Association’s pictures that had been sent to an exhibition in Paris could convince Russia and France to withdraw troops from colonial conflict-how quickly world peace could be achieved! The anti-immigrant declaration of “I believe in driving him out of our country” is surprising coming from the liberal Twain. One hopes he was playing to the sentiments of his audience rather than some xenophobic desire to keep America free of the Chinese. The Boxers’s fierce opposition to Christianity did not make them popular in the United States. However, the statement could also be read as a converse to the statement that the Boxer is “driving us out of his country”, a form of quid pro quo. Twain’s short address connected two unlikely ideas: the Boxer Rebellion and the American public school system. The speech is humorous, highly political, and frighteningly prescient. The thesis of his argument is not found in the title, but is found in the concerns he has about the funding of public education in America and abroad. 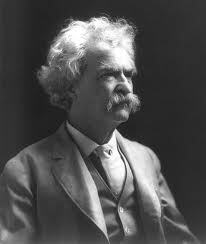 In summary, Twain believed that nations who choose to fund armies over education will not be great. Education is necessary for world peace. Mark Twain may have claimed that “I am a Boxer” in this short address, but he communicated quite clearly “I am an Educator.” Public education already had wonderful resources in the literature of Twain with The Adventures of Tom Sawyer and Huckleberry Finn. This speech solidly affirms his belief in the importance of our public education system. His contributions to the profession of education have not been matched since.